The art films and paintings of Anders Tomlinson. These are some of Anders’ painting groups ready for exhibition. 38 Art-Tars, moving and grooving in celebration of spirit and color, treat viewers with respect. The series goals was too move the eye across the surface like a cultural pre-electricity arcade game and have bright colors heighten the visual excitement. These are as close to Kandinsky that Anders will get. A nod to Miro, Tobey, and Chagall, and many others, is in order. Tar Spirits, Tar Column and Tar Dance are 36 inches wide. Large swashes of custom made color, spun atop textured backgrounds, begin the visual dance. Point – counterpoint, balance – counterbalance and marks – unmarks drive movement and directions. These may be the most dramatic of Anders surfaces. Egg Man and Tars on Parade are each 36 inches tall. Early Art Tars began in 1988. Studio stops along the way included Econdido, CA., Klamath Falls, OR., Tulelake CA., and San Diego, CA. The series was finished in 2009 except for a couple of large pieces that are currently on the work bench in progress. Internal Cleaning, Mona Joy Jester and Trio Escaping Make an attractive triptych. Texture triumphs dancing across the surface with carefree abandon. Music has a role in the Art-Tars. There are rhythms and colorful notes scattered across a score. Foreground elements are solos against a dense compositional tapestry. Art-Tars = Fusion. Green Flash and Tar Drips are each 40 inches tall. Inter-snaking, Building Blocks, Rising and Tempest are all 48 inches tall. Imagine a room full of Art Tars, in handsome frames, staring back at you. Can you see the music? Recycles, 36 paintings strong, is one of Anders’ favorite groups of paintings. The first rule, each group has working rules and goals, was to use his collection of paint refuge and incorporate them into a series. Recycles become mixed-media pieces with all the media being his paint or tools. Another rule was to let the masonite panels show through layered washes and applied media. The water used for washes and cleaning brushes came from water collected as the shower warmed up. Bonding and Rebonding were cut from the same panel, each is 36 inches wide. Recycles include paper towels that were used to absorb paint from several paint series at work. The towel fragments are now prints to be used as collage elements. They became the primary compositional anchors. Painting is an opportunity for Anders to put personal philosophy into action. No paint is left behind. If paint is squeezed from a tube it must be used. And a little paint can, must and does go a long way. There are always many paintings waiting for excess paint that can no longer be used on a work in progress. Food Pyramid, Cyclops and Lava Fun are each 36 x 24 inches. Framing Recycles will be a creative challenge. Their old world color-composition and modern abstraction- techniques open the doors for many framing styles. A show of Recycles will inspire and provoke response. Recycles reflect on social responsibilities that resonate with Anders’ core values. Use what is available. Leave nothing to waste. Balance everything with moderation. October Sunset Parade and Pop are both 30 x 36 inches. These works are a departure for Anders. Horizons have taken on a different meaning. The implied landscape is not always there. Juxtaposition of elements and forms transcend literal interpretation. Here is an invisible juggler with at least five objects in play. Everything floats in a game that has no intended destination only collective directions inferring a circular path. Whale Spirits, Food Chains and Floaters are each 36 x 24 inches. This series began in Klamath Falls, OR and finished in San Diego, CA, 2001 – 09. Recycles were created on 80″ x 36″ panels. After the paint scraps and paper towels were attached, the boards were cut into smaller panels, usually three to a board . A couple of boards were cut into two sections, Remix Bottom and Top are an example. Remix Bottom and Remix Top can be stacked, each is 36 inches wide. The surface is deceptive. 3D elements are melded in 2D faux atmospheres. Trap lines flatten and hide edges and drop shadows create dimension. In some cases, the 3D elements are painted flat and the 2D elements are raised with painterly devices. Mixer, Jumping Pig Fish and Business, each are 36 inches wide. There are 12 Recycles that take on representational forms. The marriage of 3D and 2D is hidden by attention given the readable images. On a whole, these are dark images of mysterious relationships and passing events. We are watching watchers watch. Contractual Agreement and Easter Island Picnic are both 24 x 36 inches. Recycles are stacked, one atop another, waiting for their moment to be seen and heard. Notes from the Lofty Sportscaster. Cosmic Migration is 30 paintings that began in 1995 on masonite panels, used as temporary ceiling panels, pulled from a construction site’s trash pile. Anders will let the viewer decide if his efforts reflect added value to what was headed to a land fill. 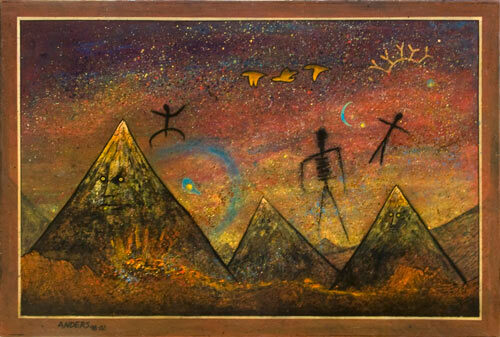 Mountain Spirits reflects the time Anders Spent near the Lava Beds, 24 x 36 inches. 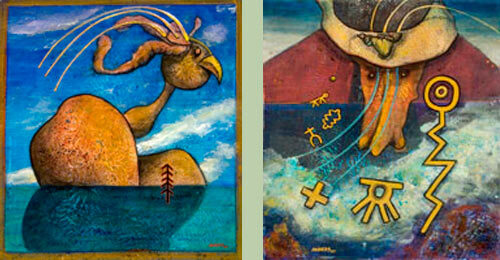 Surrealistic Environmental Observations, “SEO”, is a good description for the Cosmic Migration. As Anders was painting this series he was also documenting Klamath River Watershed natural resources issue. One of his films during this period, Fields of Splendor, captured the Spring Waterfowl Migration in Tulelake, CA. A working rule for the Cosmic Migration, each painting would include flying geese. Theater of Irrigation and Spring Flows are both 24 x 30 inches. Anders frowns on the concept of Mother Nature. Humans are dealing with Human Nature, it is all they can control, and that is in doubt. Cosmic Migration’s time frame mirrors geese on Earth. Migration is an Universal Truth, all bodies are in some stage of migration. Passing, Club Reclamation and Witness are 31 x 24 inches. Early in Anders painting years he was intrigued by Surrealism. It matched a tone he perceived watching the unending juxtaposition of modern realities. Birth Moment and Passing Volcanos are both 24 x 36 inches. These paintings are brush work, a departure from the Anders patented mix-attack approach. These were peaceful times working on a small table in a small studio-room with a few brushes and a couple of paint tubes. Naples yellow and iron oxide red are colors that find their way into all his paintings. Planetary Spawning Grounds and Future Teller are both 24 x 31 inches. Over population are the two biggest words mankind must use in a sentence properly. Almost any headline, or late breaking new bulletin, can be followed back to over population. Human will need to deal with humans in a new light. It is moments like this that Anders takes comfort in not having children. Painting filled all voids life handed him. High Pains, Storm Nexus and In the Eye are different sized canvases in progress. Anders has painted few paintings on canvas. Panels are sanctuary for his ballistic approach to starting paintings. Canvas is a different world that requires different tools and techniques. Fire Bog and Fire River pay homage to volcanos, both 24 x 36 inches. There are no answers in the Cosmic Migration. And there are no questions in the Cosmic Migration. All there is is motion and juxtaposition. Sounds, colors, emotions, smells, weather, recognition, interpretation and abstraction make a day wonderful and full. A showing of Cosmic Migration would require Anders to provide an audio atmosphere for the viewers. Chiloquin is town of 750 people 27 miles north of Klamath Falls, Oregon. It sits at the confluence of the Williamson and Sprague rivers a few miles inland from the northeast corner of Upper Klamath Lake. There are some 2,500 people in the surrounding area. Moon Princess, Laughing Spirit and Wind Princess are 31 x 28 inches. The Chiloquin paint series is made up of 24 paintings divided into two themes, Marks and People. They took shape in Fine Books And…, the best used book store between Portland and San Francisco. Richard, owner and entrepreneur, took over the building after it was the the Klamath Tribes Administration office. This is big time Indian country. Paternity, Mares Egg and Maternity are 31 x 28 inches. A common thread through all of the Chiloquin paintings are marks that Anders photographed on rock walls in Klamath and Modoc Counties. These were carved and painted by various tribes of people hundreds of years ago. Anders has always referred to himself as being a direct descendant of cave painters and drummers, and then he adds, but aren’t we all? Mountain Bird and Bird Face are 32 x 38 inches. It is a hard life living off the land in the Upper Klamath Basin. Food comes and goes with the seasons and climate cycles. People came and went with the food and water. Algae Time and Warrior are 32 x 32 inches. Pressure was a key creative force in these paintings. Elements of wet paint are mono-printed onto several panels. the results are patterns that are the same as looking at Planet Earth from space. Ancient Pawnbrokers and Island People are 28 x 31 inches. The two paintings above, are the exception to this site, are no longer in the hands of Anders. They demonstrate the merger of several techniques to accomplish what the viewer sees. This is a colorful series with bold figures in landscapes of fire, water and sky. The Relationship series began in 1984 and has continued up to today. They have been worked on five or six times with several years between sessions. Each session has been thoroughly documented. Anders have always looked at this series as the production of stills for an animated series. In a month or two he is going to back and look at the book of 1,000 slide details he shot for years: the post-production for a film of these painting evolving will then begin. Destination and Anticipation, an internal journey takes a first step. Each of these acrylic paintings, unless noted, are on 24 by 24 inches masonite boards. When one approaches the boards, which may have up to twenty layers separated by a clear coat finish, a sense of internal depth grows. Elements in these laminations will actually cast shadows depending on the light source. Contemplation and Reflection, weighing rejection against potentials. An element of this portfolio will be a musical soundtrack. A theme song, Relation-ships, was recorded in 1986. Three voices, male, female, and the couple-overlap demand copy to be written. Here, emotional layers will take flight, a moment becomes a week, becomes a month, becomes a year, becomes an era. Penetration and Consolidation, a relationship enters new dimensions. The paintings begin to intensify: more elements, more paths, deeper saturation, enhanced complexity. Anders is starting to visualize how to frame the series. He can see them them all together on a wall or room with the film being shown in multiple formats. At the any moment the viewer could be enveloped in a room that is now paintings details projected on the floor, walls and ceilings. Emotional and Conversational, attractions find common ground and ignore frictions. There will come a time when these images are reinvented with Photoshop and whole new concepts and animation elements will come forth and embrace all things natural. Anders has a large library of natural movements that he has captured in the field: time-lapse skies, water movements, elemental textures… The merging of natural design with the paintings is an exciting concept to behold. Replication and Multiplication, things become unstated for multiple reasons. There are elements of Peter Max and the psychedelic 70’s in these paintings. Design and shape play a major role of providing paths to follow through the work. Dimension is achieved by color relationships as much as overlapping elements. All of the images incorporated the same icons in various relationships. These are dense pages in a layered short story yearning to be a novel. Inspiration and Congestion, an aftermath lingers on a closing horizon. Many individuals and organizations have been involved with Relationships during the long duration of this project in progress. Anders would like to thank Lisa Meszaros, Shelly Meszaros, Don Marshall, Denver Clay, Joe Cordelle, Kit Nuzum, The Simple Band, KBCH RadioTV, Del Mar Channel 38 and many others who encouraged his efforts. The nature of these paintings is that they are used in some public media presentation and then lay dormant for years only to briefly resurface, again and again. Clownization and Cyclopization, reality tugs and pulls in surrealistic discord. The Anders approach that each painting is its own animated short film, graphic presentation, and short story continues with Relationships, maybe more so than any other Anders series. Is there a gallery that will invest its space and skills in presenting Relationships as an art show? Time will tell, it always does. Jesterization and Memorization, and then the magic is gone like beta tapes. Relationships is a common tale: one of learning, experimenting, experiencing tangents that lead one to a fuller understanding of one’s self. Of course, there is another path that leads one away from one’s self in a darken hallway of self-induced horror. Relationships: can we live with them, can we live without them, that is the question. Profilization, 36 x 24 inches, and Comparization, 24 x 31 inches. There are an additional six Relationships paintings that are not 24 x 24 inches in size. The two largest are each 48 x 36 inches. Above, are two examples of these nonconforming works. They are painted on heavily textured surfaces glued to boards. It seems like it has been a lifetime as Anders moved these boards from one place to another until this moment that they are finished. Good, there is always time to reconnect and move on, just like many relationships. ©2010 Anders Tomlinson, all rights reserved. This page took 0.670 seconds of computer labor to produce.